There are few impetuses more potent than exploration. Whether it be physical, pedagogical or spiritual, the never-ceasing desire to expand our knowledge has led to our greatest discoveries and most heinous crimes. New Worlds call to us like sirens, and one’s allure was so intoxicating that it plucked our hearts and piqued our souls from billions of miles away: an ostensibly barren, brumal little ball, Pluto. Alan Stern and David Grinspoon’s Chasing New Horizons details NASA’s mission to Pluto from the voices of explorers whose dreams, drive and crushing work eventually reached it. The challenges facing the probe, which left Earth in 2006 and reached Pluto in 2015, began long before its voyage. The little spacecraft faced numerous political and financial gauntlets before even beginning to conquer engineering and environmental challenges, a reminder that some of the greatest barriers to exploration come from within. What it discovered when it reached its destination, however, proves the necessity of the endeavor. At three billion miles away, the New Horizons probe served as a proxy for every human being waiting with baited breath back home. What it revealed were the magnificent answers all explorers lust after: the kind gravid with more mysteries. What we had long assumed to be a dead, quiet world was in fact a riot of colors and textures, a stitched-together smattering of surfaces glacé and garrulous. This is best exemplified by its massive, throbbing heart—a geographic feature now serving as its call sign, as impressive as Jupiter’s Red Spot or Saturn’s Rings. Pluto’s Heart, brilliant blue and white and abutted by mountains, boasts a convulsing mass of glacier-scored methane ice (perhaps a portend for a liquid ocean hiding beneath the surface). 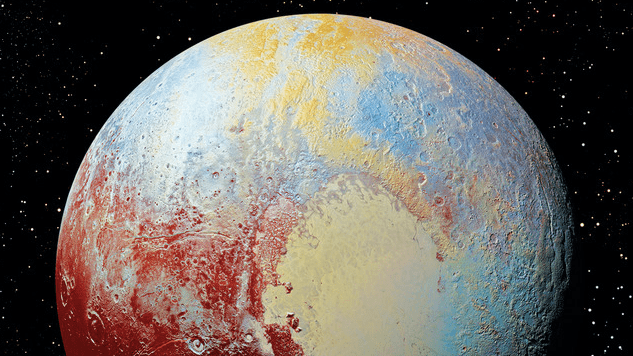 From its atmosphere to the number of its moons, almost everything we knew about Pluto was expounded upon, altered or shredded by the discoveries of the New Horizon mission. If that boring ball could boast such wonders, then what else lies beyond it? The lesson Stern and Grinspoon reveal in Chasing New Horizons, the one underscored whenever doubts accrue, is this: The value in exploration and discovery is that they catalyze inherent change. In widening our breadth of knowledge, every abyss we assay—beneath the sea, beyond the solar system, between atoms—contains nearly unlimited possibilities. For proof, look no further than three billion miles away to a planet whose “heart” throbs as ours does when we gaze into literal worlds of opportunity and wonder.